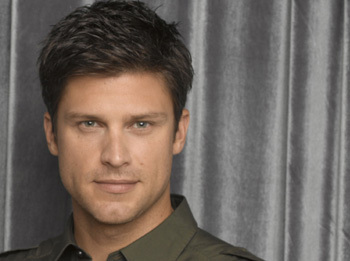 Greg Vaughan, formerly Lucky Spencer on ABC’s GH, nabs role on CW’s ‘90210’! Before the ink has even dried on his pink slip, Greg Vaughan has already booked a gig on the CW’s hit series, 90210. The recently fired General Hospital star had Twittered earlier in the week that he was auditioning for a role on a CW show. Last night the actor tweeted that he booked a gig on 90210. TVSource Magazine can exclusively reveal to you that Vaughan will be playing a yet-to-be-named yoga instructor on an upcoming episode of 90210. Vaughan’s character interacts with Debbie (Lori Laughlin) and Kelly (Jennie Garth) confirms a CW rep. The episode will air in January. Vaughan did a 6-episode run on the original series as Cliff Yeager, a love interest of Tori Spelling’s character, Donna. Vaughan is no stranger to the CW or the CBS family (the CW broadcasts the show and CBS produces it). Vaughan had an 18-episode run on the former WB network show Charmed as Piper’s (Holly Marie Combs) ex-baseball star boyfriend, and he also starred on the number one rated daytime drama, CBS’ The Young and the Restless. Vaughan’s Diego Gutierrez sexed up Sharon Case for a year and then moved on to General Hospital in 2003 as the third actor to portray Lucky Spencer, the son of the iconic supercouple Luke & Laura (Tony Geary and Genie Francis). In 2008, Vaughan was named TV Guide’s #3 on their list of Soaps’ Sexiest Actors. After nearly 7 years playing Lucky, General Hospital fired Vaughan last month to bring back 3-time Daytime Emmy Winner Jonathan Jackson, who originated the role of Lucky Spencer. ABC’s official statement on Vaughan’s departure was “Greg Vaughan has decided to vacate the role to explore new opportunities. We thank him for his years engaging our audience and dedication to the show and network. The cast and crew wish him well in all his future endeavors.” However, fans had already learned from the actor himself via Twitter that he was let go against his own wishes. TVSource Magazine is thrilled that Greg Vaughan has booked this gig with 90210 and we wish him and his family all the best. We would also like to congratulate him on the upcoming birth of his second child with his wife Touriya.